As the most recent of Woody Allen’s efforts, big things could have been anticipated – but have they been fulfilled, really? 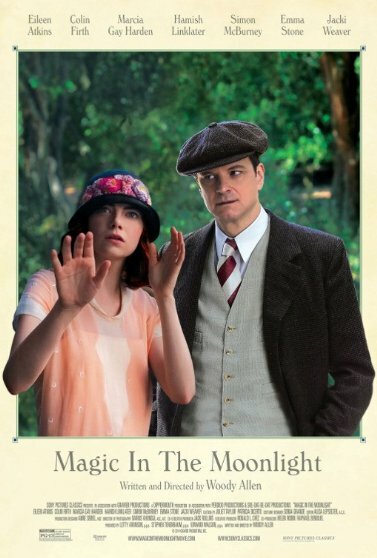 Magic in the Moonlight is set in the 1920s and follows Stanley’s (Colin Firth) attempts at uncovering Sophie (Emma Stone) as a fraud – a wanna-be mystic who supposedly swindles the rich for their money. But no matter how hard he tries, Sophie keeps surprising him with her magical abilities – and eventually, her magic may even exceed that which he thought possible. From a stylistic point of view, the movie is indeed quite handsome, with the beautiful scenery that it provides, the elaborate costumes, and the general magical-romantic feeling to it. To some, it might feel a bit too much; to others, it may hit just the right spot in playing with and invoking clichés. And indeed, it’s trying very hard to impress, to make you feel good, and last but not least, to feel the magic in the moment. But of course, as with anyone who’s ever watched anything by this acclaimed director, we know that appearances are tricky, and things are most often not what they seem – not completely, at least. Woody Allen is famous for his self-reflexivity, for making everything slightly meta, and while the film definitely attempts this, it all feels a bit rushed. Clearly, it’s all about illusions – it’s all about invisible walls being torn down – it is, after all, reflecting on the nature of film, of cinema, of media in general maybe, especially in playing with our expectations. Of course we’re totally with Stanley when we hear that someone’s supposedly magical – especially he, who only pretends to be magical, should know about these things, right? – and we want that woman to be unmasked as much as he does. But how much is false and how much is real? We are both disappointed and excited about his growing confusion – but once his world changes with her efforts, the film seems to stumble and topple over quite a bit. It is clear what is attempted here, and it could have become great, but at some point, the writing just seems to be a bit off – and that’s a real shame, because it had real potential right there. …it really is a bright, feel-good movie that forces a chuckle or two, or more, from you, and that’s mostly on Stanley’s shoulders. Colin Firth manages to excel with typically witty, sarcastic dialogue, but again, it falters with the movie’s first big turning point. There are others, naturally – but at large, it is a pleasant experience, and even if the idea itself is not as bright as in other films, you can definitely have a really great time with it. It’s pretty to look at, it’s funny to hear, and it all depends on you, really, what you get out of it. Yes, it may not have this typical self-reflexivity, at least not to the extent that we’re used to – but instead, it might say a lot more about yourself, and how you see the world. Do you believe that some things are supposed to be unexplained? What is your relation to cinema? How do you distinguish fiction from reality? It’s all there – it may not be as in-your-face as you’d like, and it may not be as masterfully done as Allen certainly could have, but it’s certainly not a waste of your time, either. If you’re out for a nice, funny, feel-good film with an edge, this is it.